Well, we almost got into the 9’s in the ¼ mile with boost alone in our full weight 2011 GT on 20in wheels. For the 2014 season, we already got off to a pretty good start with our 2011 5.0L GT/CS. 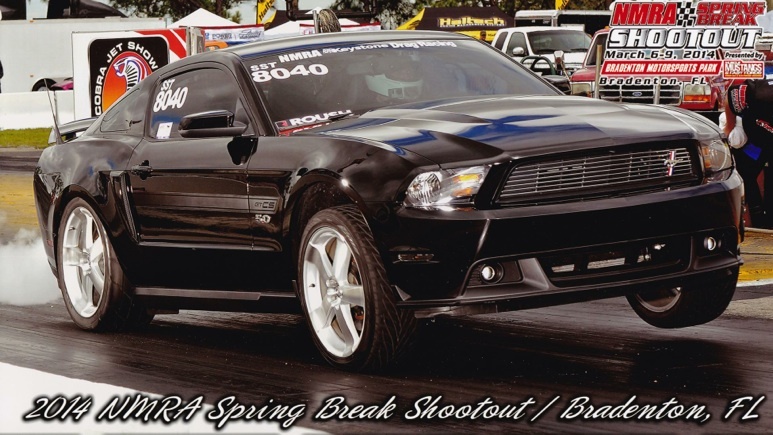 In early March we made the trip to the all Ford NMRA race in Bradenton Florida. We ran the car in a class known as “Super Stang”. It’s a class that is basically set up for 2005+ Mustangs. Out of about a 15 car field, our 2011 GT qualified number one, with the fastest MPH, and quickest ET for that class. Surrounded by many other Coyote equipped and modified cars. The Alternative Auto car was way ahead of many other comparably equipped, and even lightened up 2011+ 5.0L cars. On 14-15psi of boost we got our best ET so far with the car on boost only. We managed a 10.05 @ 136.00mph. And 9.80s @ 143mph, with a shot of NOS on top of the blower. We even weighted the car at the track and she came in at 3970lbs with driver. This is still with a totally stock Torque convertor and 3.55 gears in the axle. And on “out of the pump” e85 fuels. Our 2011 GT is also now equipped with a 150hp shot of NOS on top of the Roush TVS blower. For a lot of folks this may seem for a lack of better words “Crazy”. But NOS on top of boost is something I’ve been into for many years. When this is done correctly, you can safely add lots of power to an already boosted application. As long as the octane is there, and as long as proper tuning is applied, and by tuning; this means A/F and most importantly; proper timing retard to go with the NOS shot,,,, we’ve safely sprayed blower cars for tons of customers and several of my own personal cars with blowers for many years. The key reason for NOS on top of boost is for obvious reasons like; more power cheap and easy. But I’ve learned over the years to understand and know the limitations of a given blower. It’s not as easy as some might believe to just keep on more aggressively spinning certain blowers, and just make more and more boost and go! Not always the case,,,, Lots of blowers like twin screws, roots and etc, will make a lot more heat as you raise the boost. But they will also make more heat sometimes even when you’re just driving normal from being grossly over-spun in an effort to make more high RPM boost. And highly over spun blowers can start to actually drop boost and become inefficient when they are over spun at high engine RPM’s. A lot of guys will mistaken this high RPM boost drop as just simple belt slip (which is often the case with some), but even when the belt isn’t slipping – a boost drop on Roots and Twin-Screws isn’t good, when it’s the blowers lack of efficiency causing the drop (if belt slip is ruled out). A little boost drop is acceptable. But what a lot of guys don’t get is that when it’s only on the dyno and the ¼ mile,,, It’s not the end of the world (short blips overall), but when you go WOT for much more extended periods is when this will sting you sometimes. This is what leads myself and many others toward hitting them with some NOS on top of boost. It allows a more limited blower system to make more power without having to replace the blower for a larger and more costly upgrade in many cases, and so the NOS adds the power without increasing the inlet temps at all, and avoids costly blower upgrade. And also on a more technical side of things — As many may or may not know,,, whenever you ether add boost, or add NOS to a motor. The ignition timing has to be correct (amongst other tuning things). Timing needs to be retarded as the boost or NOS is ingested by the motor. As most may or may not know, that there is no external devices or ignition boxes that can retard timing “on the fly” on these very modern Ford’s when the NOS is “engaged”. On older pre 2005 Fords we could program chips that had actual wires plugged into the chip that could seamlessly switch tunes on the fly, and make changes for the NOS instantly. This is no longer the case for the 2005+ Mustangs, which have “flash only” ECU’s. So we’ve come up with a solution that allows us to use a “wet” NOS system and will effectively pull timing from within the tune on the fly when the NOS is triggered. What we’ve come up with is a very clever way to trick the computer into seeing very high ACT (air charge temps) only when the NOS is triggered. This requires specialized custom tuning to go with it as well a modified ACT sensor circuit too. And what this does is give us the best of both words by allowing normal ignition timing for best naturally aspirated or boosted performance, and a unique NOS timing retard on the fly when triggered. Without the need of a re-flash only when you’re going to spray as most will do. Or will switch to some sort of Race fuel only when they’re going to use the NOS. This ACT trick has been proven to work excellent on several of our customer’s cars. It is more labor and time consuming to perform all this along with the rest of a typical NOS kit, but very well worth it. There is no other form of timing reduction boxes for the 2005+ Mustangs and other Fords. We’re going to continue to tweak our 2011 GT for the 2014 season and we’re hoping for 9.90s with boost only and somewhere deeper into the 9s with the NOS supplementing the boost. For now we’re only using the NOS after the car shifts into 2nd gear and the remainder of the ¼ mile. We almost got into the 9’s in the 1/4 mile with boost alone in our full weight 2011 GT on 20in wheels.